“Every single one of those stars could have a New York City, a Paris, a London, and we would have no idea,” Nate Tellis of the University of California, Berkeley says about the 5,600 stars scanned in a new study gathered by the Keck Observatory in Hawaii one of the world’s most powerful telescopes. Keck astronomers spent hours staring at the night sky in search of exoplanets and accumulating huge amounts of data about potential new worlds elsewhere in the Milky Way. Tellis, who searches for laser light, powerful pulses of photons that could be as short as a nanosecond wondered if somewhere buried in that data, could there be a signal from an intelligent civilization trying to reach Earth? 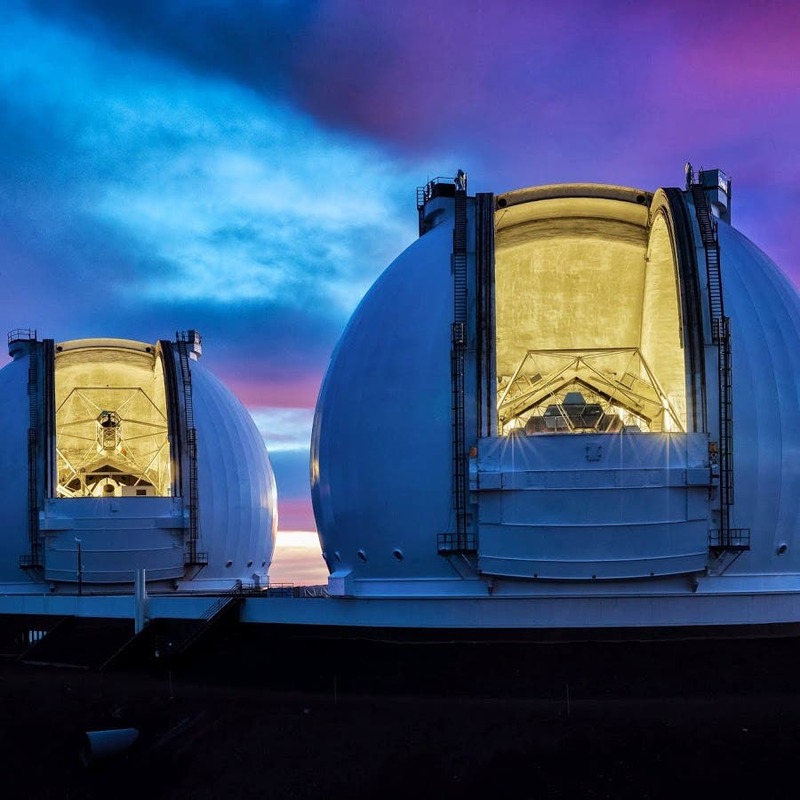 Tellis, along with astronomer Geoff Marcy, recently dug into the Keck archives for data from 5,600 stars, observed between 2004 and 2016 using a laser-detecting computer algorithm to comb through all that recorded starlight using the Keck 10-meter telescope and spectroscopy with high resolution. Laser emission lines coming from non-natural sources are distinguished from natural astrophysical sources by being monochromatic and coming from an unresolved point in space. attempts to detect the generation of light from civilizations residing elsewhere in the universe. Searches have been conducted using a variety of wavelengths, most prominently with radio telescopes sensitive to centimeter wavelengths with Arecibo (L band), at 1/10 meter wavelengths with the Greenbank radio telescope, and at centimeter wavelengths with the Allen Telescope Array some targeting arbitrary stars and galaxies and recently aimed toward known exoplanets. Searches at optical wavelengths (“OSETI”) have also been conducted, both for continuously transmitting lasers and for sub-µs-duration light pulses. To date, no convincing evidence of other technological civilizations has been found. New SETI efforts have begun that employ new wavelengths and achieve greater sensitivity. One search was conducted at mid-infrared wavelengths to detect the waste thermal emission from the vast machinery of advanced civilizations, often called “Dyson spheres”. “I think when you’re doing a SETI project, it’s very important not to get discouraged by a null detection,” Tellis said. “SETI has been in process for about 60 years, and it’s been non-detection after non-detection after non-detection. Some SETI efforts involve detecting the dimming of starlight as planet-sized technological constructs pass in front of stars. Future SETI efforts will take advantage of the next generation of large radio telescopes, including the Square Kilometre Array. There are also proposals to broadcast (rather than just receive) bright beacons as Galactic marquees to advertise our human presence. But international agreements are needed before we compose and transmit brilliant messages moving irreversibly at the speed of light, with unknown consequences. Recently, there has been increased interest in searches for extraterrestrial optical and near-infrared lasers, including those emitting short-duration pulses or periodicities. The advantages of interstellar communication by optical and IR lasers include the ease in producing high intensity, diffraction-limited beams to transmit over Galactic distances, and achieving relative privacy with high data rates exceeding 1012 bits per second. Astronomers inadvertently shoot laser beams toward interesting astronomical objects, including exoplanets and the Galactic center, by employing laser guide star adaptive optics on large telescopes with typical power of ∼7 W. NASA has demonstrated the use of pulsed infrared lasers for Earthto-Moon communication at a data rate of 622 Megabits per secon. Telis and Marcy searched for laser emission coming from regions separated from stars by tens to hundreds of AUs in projection, where the laser light does not have to compete with the starlight. An advanced civilization might emit many lasers of varying beam sizes, constrained by available optical technology, resulting in unavoidable spill-over at the receiver. The laser light would continue propagating in the original direction, past the intended receiver. The filling factor of such beams in the Milky Way Galaxy is completely unknown. More purposefully, an advanced civilization seeking to indicate its presence to nearby habitable planets might use lasers to offer a bright and unambiguous beacon of its presence. Natural astrophysical conditions exist that allow gas to lase in the near-infrared. But the only observed astrophysically pumped lasers at optical wavelengths occur in non-LTE conditions that produce population inversions in neutral oxygen, causing an extraordinary emission line. The presence of a bright, unresolved emission line at any other optical wavelength would be worthy of further attention, including the possibility of a non-astrophysical source. The past 20 years of discoveries of exoplanets motivate a new perspective about SETI. To date, over 1500 exoplanets have been confirmed with accurate orbits, and another 3300 planet candidates have been identified by Kepler as likely real but still need confirmation at the 99% confidence level. Stars with known exoplanets make excellent targets for SETI searches, and such planetary systems have already been surveyed for technological transmissions at radio wavelengths. Planetary systems found by Kepler are particularly valuable for SETI searches because their edge-on orbital planes enhance the probability of our detecting spillover – 3 –transmissions between planets and satellites within that planetary system. However, Kepler showed that over 50% of both solar-type stars and M-dwarf stars have planets within 1 AU of the host star. Planets smaller than 1.5 Earth-radii are common and often harbor a largely rocky interior Thus, all FGKM-type stars have comparable value as targets for SETI searches, whether or not they have known exoplanets, as the majority of stars harbor planets of 1-2 Earth-radii within a few AU. Only binary stars separated by less than a few AU are probably poor sites for SETI searches, due to a lack of stable planetary orbits. Otherwise, planets with liquid water may permit progressively complex organic chemistry toward the nucleotides and duplication of RNA within fatty acid proto-membranes. Imagine another life-form on a distant world conducting the same kind of search for laser light, Tellis said. “If we had pointed our telescope at Earth at sort of the distance that we’ve been doing here, we wouldn’t have seen us,” he said, because Earth is not firing a laser beam into the universe as a beacon of its existence. Other worlds may not be, either.